Copyright © 1990-2009 by DisplayMate Technologies Corporation. All Rights Reserved. Every display technology has its own set of unique strengths and weaknesses and limitations. While each technology steadily improves over time, memories of their initial weaknesses and limitations often persist for a long time afterwards, and can turn into demons that plague the technology forever. The best example of this effect are Plasmas, with their so-called “burn-in” (which is actually uneven aging), a problem that was technically overcome many years ago but which lingers like an 800 pound gorilla that still threatens to kill this excellent display technology. Plasma manufacturers bear much of the blame because they have chosen to avoid this issue in their marketing (like an ostrich hoping that the problem will simply go away) rather than confronting this widely held perception. LCDs have their own 800 pound gorilla: limited Response Time, which causes motion blur. Just like Plasmas, this was a significant problem for LCDs many years ago, and we’ll demonstrate that it too is no longer an issue now. But unlike Plasmas, the LCD manufacturers have turned this into a brilliant marketing strategy, offering ever more sophisticated and enhanced motion processing and ever higher 120 Hz and 240 Hz screen refresh rates to repeatedly over-sell a solution to a problem… that is no longer a problem. Figure 1. The Shoot-Out with the lights turned on. Photograph by Dieter Michel, Publisher of PROSOUND and Medientechnik & Systemintegration Magazines, Germany. Motion blur is a well known issue with LCDs. It arises because the liquid crystal, which is the active element within an LCD, is unable to change its orientation and transmission rapidly enough when the picture changes from one frame to the next. Since the standard video rate is 60 frames per second, a pixel is expected to be able to fully update its light transmission opacity within 16.7 milli-seconds (a 60th of a second). If it takes any longer than that then the image will show some degree of lag, which appears as a trailing smear or blur whenever there is motion. It also affects the visibility of the leading portions of moving objects. LCD motion blur is generally evaluated with an industry standard specification called Response Time. Unfortunately, it’s not a particularly good indicator for real picture blur because it measures the time that it takes for a pixel to go from black to peak intensity white and then back to black again. However, most picture transitions involve much smaller and more subtle shades of gray-to-gray transitions, which can take considerably longer to complete. On the other hand, blurring is much harder to detect visually when there are subtle gray-to-gray transitions because the initial and final states are so similar. But it’s even more complicated than that because every pixel is actually made up of independent red, green and blue sub-pixels that have their own separate intensities, frame-to-frame transitions and times. So visual blur within a picture that has some motion is a fairly complex and nebulous phenomenon. 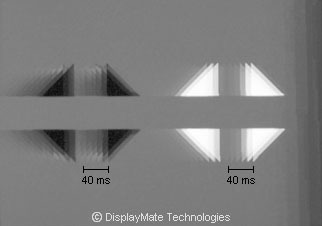 The Response Time and motion blur depend on many factors, including the viscosity and thickness of the liquid crystal layer. Many different methods of electronic processing are used to try to speed up the pixel-to-pixel transitions. One common method is to temporarily exaggerate the drive voltage used during a transition, which is called overdriving. It’s sort of like giving the liquid crystal an extra hard kick in the pants to get it moving quickly. The problem is that it’s very hard to give just the right amount of kick for all possible transitions, and that leads to overshoot, inverse ghosting, and image flicker. Another method is edge enhancement using high frequency peaking. And then there is the one that all of the manufacturers are bragging about – updating the screen more frequently by increasing the refresh rate from 60 Hz up to 120 Hz or more. We’ll show photographic evidence for all of these below. Most either introduce objectionable artifacts into the images or are just ineffective marketing gimmicks. Because the published specifications can have a considerable impact on sales, it is often more important for a manufacturer to reduce the black to peak white to black Response Time value rather than improving the visually more important gray-to-gray transitions or reducing the motion artifacts that result from electronically pushing the Response Time. As a result, the LCD display with the fastest Response Time specification may not have the smallest visual blur. This was the case in our tests. Figure 1 shows 11 HDTVs in the DisplayMate Technologies Demo Lab. Included are eight LCDs, two Plasmas, and one CRT Sony Professional HD Trinitron Studio Monitor, which was used as the reference standard. This was an in-depth scientific study that included precise calibrations, comprehensive spectroradiometer measurements, and a large number of jury panelists that viewed test patterns, test photos, and lots of high quality High Definition video material. The Shoot-Out was a large operation that was jointly produced by DisplayMate Technologies (www.displaymate.com) in collaboration with Insight Media (www.insightmedia.info), however, all of the technical analysis was done by the author. Part I of this article covered LCD and Plasma picture quality, color and gray-scale accuracy, color gamuts, contrast ratios, and viewing angles. The HDTVs included models from the top-tier brands of (alphabetically) LG, Samsung, Sharp and Sony - from the mid-line to top-of-the-line models. All of the units were from the 2008 model year. Differences between the 2008 and 2009 models are primarily in their marketing hype. For this article we had three flagship top-of-the line LCD models from Samsung (LN-T5281F), Sharp (LC-52D92U) and Sony (KDL-52XBR4). By studying the top-of-the-line models from the market leaders we were assured of examining the state-of-the-art for each display technology and each manufacturer. The consumer mid-line models included LG (42LG50), Samsung (LN40A550P3F), and Sony (KDL-40V3000). The remaining two LCD units were consumer HDTVs but not commercially available models. The top-of-the-line Sony XBR and Sharp units had 120 Hz screen refresh, the top-of-the-line Samsung had strobed LED backlighting, and all of the other units had standard 60 Hz screen refresh. The goal was to determine the degree to which this varied advanced technology affected visible motion blur. The first step in evaluating motion blur is to use specialized moving test patterns in order to cleanly examine and analyze the blur and related artifacts. After studying these results we’ll graduate to moving photographs and finally to live video. To generate the moving test patterns and photographs we used DisplayMate Multimedia with Motion Bitmaps Edition, which includes 25 proprietary motion test patterns and 35 test photos that can be moved in different directions and speeds on screen. This digital video was fed simultaneously to all of the HDTVs, which were compared side-by-side in a Shoot-Out configuration as shown in Figure 1. We used a Nikon D90 DSLR camera to photograph the moving test patterns and photographs. The screen shots were taken with a shutter speed of 1/160th second, which is less than the refresh cycle time. These screen shots objectively measure the LCD display's own hardware blur, artifacts, and response time, and are consistent with what a human observer actually sees with these moving images. 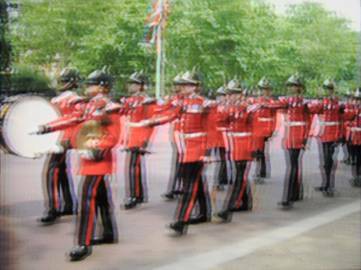 The differences in motion blur between the 8 LCD HDTVs was not large. There were only minor differences between all of units. The reason is that the visible blur was considerably longer than the 60 Hz video frame rate, so it didn’t matter whether the screen refresh was 60 Hz or 120 Hz, or whether the LED backlights were strobed off during the frame updating. Similarly, varying the electronic processing enhancements that some models offer, which are supposed to reduce motion blur, only served to introduce objectionable contours, edges and other artifacts onto moving objects without reducing the overall motion blur. In addition, there was no notable difference in motion blur between the top-of-the-line models (which all had 120 Hz refresh or LED strobing) and the mid-line models (which all had standard 60 Hz refresh), and which cost less than half of the high-end models. To illustrate the motion blur results we took screen shots of the Sony XBR, which was the best performing LCD in Part I of the Shoot-Out in terms of picture quality and accuracy. It also had a trifle less motion blur and artifacts than the other units, but again the differences were not large. The manufacturer’s published Response Time for this model is 8 ms. 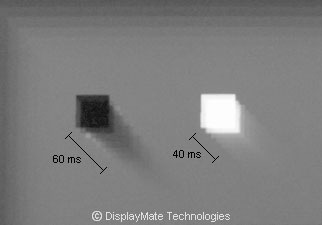 Since this corresponds to a double transition - from black to peak white and then back to black again - the single transition time (from black to white or from white to black) should therefore be about 4 ms.
For the DisplayMate test patterns shown below a live view by eye clearly detected blurring out to considerably more than 60 ms. The screen shots are not quite as sensitive as the live view by eye. But in all of the screen shots it is possible to make out at least 8 individual refresh cycles, each offset from the other by 1/120th second (which comes to about 65 ms). Since the blur trails decay smoothly over time, any definition of Response Time, whether visual or instrumented, is ad hoc because you have to pick a specific cutoff intensity value. The screen shots are marked with the indicated times. Compare them to the manufacturer’s single transition Response Time specification of 4 ms. In order to show the blur in the screen shot photos as clearly as possible we used motion speeds around 1000 pixels per second. At this speed it takes two seconds to cross the 1920x1080 screen width. Objects frequently move much faster than that in real video. Figures 2a to 2f are screen shots of several DisplayMate test patterns moving at different speeds and directions. In all of the screen shots it is possible to make out the individual 120 Hz refresh cycles. 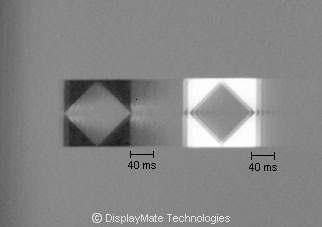 The white tips seen on edges and fine detail in all of the moving test patterns are artifacts resulting from the electronic processing enhancements used to reduce the Response Time. The dark outer edges seen on the screen shots are due to the response time lag in transitioning from a surrounding black background (not shown) to the gray background. The dark trails appear somewhat more pronounced than the bright trails because, while the LCD’s response is linear, the eye's visual response is based on (nonlinear) brightness ratios, which accentuate the differences in darker content. Figure 2a. Measured H and V Speed 1093 pixels per second. Figure 2b. Measured H Speed 1083 pixels per second. Figure 2c. Measured H and V Speed 820 pixels per second. Figure 2d. Measured H and V Speed 1609 pixels per second. Figure 2e. Measured H Speed 1190 pixels per second. Figure 2f. Measured H and V Speed 991 pixels per second. Note that in the screen shot with the highest motion speed, 1609 pixels per second in Figure 2d, the most recent frames (upper left and right) are clearly still developing and have not reached their final density (rise response time). Most of the other screen shots also show this same effect, although it is not as obvious. The test patterns in Figure 2 are only a small selection of the complete set of DisplayMate motion test patterns that we examined, which include many different combinations of gray-to-gray and color-to-color transitions. Test patterns are also perfectly valid images, no different in principle from any other image or picture content that is displayed. Absolutely every effect, artifact and defect that you see in any test pattern also appears in every image and picture. The difference is that test patterns are often constructed to maximize the visibility of specific effects, artifacts and defects. 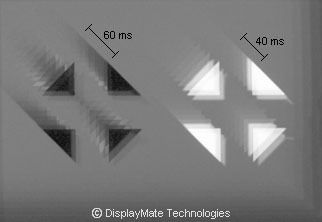 That is the definitely the case with the DisplayMate motion test patterns used in the previous section, which were carefully designed and optimized to show the motion blur and artifacts. Photographic images, on the other hand, typically consist of a very complex and varied admixture of blended picture elements. With so much going on in an image, motion blur is easily obscured and lost within the complex variegated imagery of a typical photograph. In particular, the photographs lack the uniform backgrounds used in the test patterns, which make it easier to see the motion blur trails. Still, from what we learned with the test patterns we expect to be able to see the effects of motion blur most easily when there are sharp bright to dark or black to dim transitions or strong to weak color saturation transitions. Figures 3b and 4b are screen shots of two moving photographs and Figures 3a and 4a are identical screen shots without any motion. Notice how much less noticeable the blurring appears because of the complexity of the image content and the uneven backgrounds. It’s important to note that we picked the two photos out of the 35 within DisplayMate Multimedia with Motion that showed the strongest visual motion blur. Most of the other photographs had less visually noticeable blur. Figure 3. 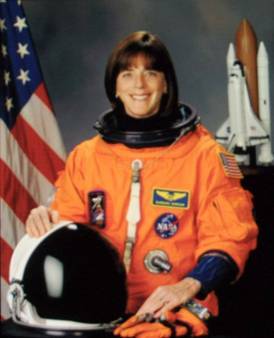 NASA Photograph of Astronaut Barbara Morgan. A: Left Photo: No motion. B: Right Photo: Measured motion is 1009 pixels per second right to left. Figure 4. Guard Parade Photograph by Lauren Soneira. A: Left Photo: No motion. B: Right Photo: Measured motion is 1018 pixels per second right to left. In Figure 3 there are 4 strong refresh cycle images that are visible (33 ms) and a total of 8 refresh cycles can be seen in portions of the picture (67 ms). In Figure 4 there are 3 strong refresh cycle images that are visible (25 ms) and a total of 6 refresh cycles can be seen in portions of the picture (50 ms). Their visibility depends on the nature of the intensity and color transitions and the textures of adjacent content that overlap as the image moves. The speed of these images is 1000 pixels per second, which corresponds to a screen crossing time of 2 seconds. At slower speeds the length of the blur is proportionally smaller. So for these photographs the blur is unlikely to be noticeable for speeds under 500 pixels per second, which corresponds to screen crossing time of 4 seconds, a relatively slow speed. On the other hand, most of the other photographs had less noticeable blur, so visible blur is very image content dependent. Moving photographs are none-the-less moving static images, which are quite different from live video, where the images are part of a complex and varied mixture of continually blending picture components that are themselves constantly changing in both time and position. The closest thing to moving photographs are the news and stock tickers on some television stations, and the vertical title rolls at the end of most movies. Television stations fine-tune their tickers to minimize the appearance of motion blur and artifacts in consumer TVs, a high percentage of which are now LCDs. While moving test patterns and photographs are very interesting and enlightening for studying motion blur and artifacts, live video is what consumers actually watch on their HDTVs. With even more screen activity going on we expect to visually detect much less motion blur in live video than with either the moving static photographs or test patterns. The first issue to consider is that there is no such thing as typical live video because of the incredible variety and diversity of content. Fortunately, we know from the moving test patterns and photographs what kinds of picture content are most likely to produce visible motion blur. And of course there needs to be lots of on-screen motion. Most of the live video sources that we chose were sports based because they have lots of motion and most have brightly colored uniforms and background content. We recorded them on an all-digital High Definition Tivo from full bandwidth over-the-air ATSC broadcast television. It directly records the original broadcast mpeg data stream without any processing or degradation. Note that satellite and cable video sources have reduced signal bandwidth that introduces additional motion artifacts because of the extra compression needed whenever there is motion in the picture. We also didn’t use any film based content, because it’s shot at 24 frames per second and requires considerably more interpolation and motion processing than video cameras with 60 fields per second. Included were hours of recorded football, basketball, hockey, skiing, and golf. Most of these are daytime or brightly lit events. For darker content we used nighttime NASCAR racing, indoor gymnastics and ice skating, the television show Dancing with the Stars, and Over America, which is a Blu-ray HD video that is shot entirely from a fast moving helicopter. It has 90 minutes of continuous full screen motion, with both daytime and nighttime scenery. It includes lots of very challenging high speed motion content. With these choices of videos we were using very aggressive content for detecting motion blur. One important issue for live video, as opposed to the previous precision computer generated moving photographs and test patterns, is that they are all shot from video cameras under varying conditions and may have unknown degrees of video processing. That can result in source video that is blurred with varied artifacts. We certainly didn’t want to blame an LCD for a blurred or defective picture when the cause was in the source. In order to carefully monitor the quality of the source video we used a Sony Trinitron Professional HD Broadcast Studio Monitor, which is a CRT and did not have any visible motion blur or artifacts (except for barely visible tiny phosphor trails seen only in fast moving test patterns). So, whenever there was questionable content we carefully evaluated it on the CRT monitor. The Shoot-Out was fully operational for several months, so we had lots of time to study and compare all of the effects, and over that period of time we had several dozen people come by to see it running and evaluate the effects themselves, including industry experts, manufacturers, engineers, reviewers, journalists, and ISF instructors, all of which are trained observers. All of the HDTVs were fed identical simultaneous digital video from the content list above using the digital Tivo or Blu-ray player. They were all compared side-by-side in a Shoot-Out configuration as shown in Figure 1. If any viewer thought they detected motion blur on any HDTV we would repeatedly press the 8-second Tivo backup button and watch the sequence over and over again on all of the units (including the CRT monitor) until we fully understood exactly what was happening on each HDTV. We did the same thing with the Blu-ray player and its content. The conclusions from everyone that participated in the Shoot-Out were consistent across the board and will likely surprise most consumers: there was essentially no visually detectable motion blur on any of the LCD HDTVs in all of the extensive live video content that we assembled. When people thought they saw motion blur, with only a handful of minor exceptions, the blur was either in the source video or a temporary visual illusion that disappeared when the segments in question were reviewed. Unlike the moving test patterns and moving photographs, the eye is unable to detect the blur in live video because the images are much more dynamic and complex, and undoubtedly because of the way the brain processes and extracts essential information from visual images. The results were identical for all of the LCD HDTVs, regardless of whether they had 60 or 120 Hz refresh rates, strobed LED backlighting, or advanced motion enhancement processing. Response Time specifications are not a scientifically accurate or meaningful indicator of picture blur, which is what we have found with most of the HDTV specifications in our Display Technology Shoot-Out article series. In fact, in our tests the LCD with the shortest Response Time had the greatest motion blur. 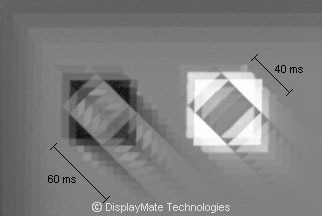 You’ll see published values down to as little as 2 ms, but the motion blur we measured with moving test patterns on the top-of-the-line HDTVs was over 40 ms, which is more than a factor of 10 greater than the manufacturer’s specifications. We also found that the proprietary motion enhancement processing technologies provided in most HDTVs actually just introduce ugly motion artifacts into the image rather than reducing the overall visual motion blur. The best picture quality was obtained with the motion enhancement processing minimized or turned off. 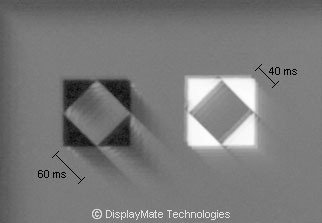 After extensive side-by-side objective testing with moving test patterns, moving photographs and live video we found that there was no visually detectable difference in motion blur performance for current mid to top-of-the-line LCD HDTVs, regardless of their Response Time, 60 or 120 Hz refresh rates, strobed LED backlighting, or motion enhancement processing. While there was considerable motion blur in the moving test patterns, motion blur was simply not visually detectable in real live video content during our extensive side-by-side testing. With only a handful of minor exceptions, whenever blur was seen in live video we always found it to be in the source content or a temporary visual illusion that disappeared when the segments in question were reviewed. This is undoubtedly due to the way the brain processes and extracts essential information from dynamic and complex moving images. These results and conclusions will surprise many technically savvy consumers and videophiles because there has been so much talk about Response Time and motion blur. Like Plasma “burn-in” some of this is just old information and memories. A lot of the current “knowledge base” on this topic are simply the echoes from all of the marketing brouhaha. It’s also very easy to think that you see blur when you’re looking at lots of fast action on a single TV, and a lot of it undoubtedly has its origins in the human visual system. It just doesn’t stand up to the extensive scientific side-by-side testing that we’ve described here. Our most important and significant result is that the LCD manufacturers have finally beaten the motion blur problem. So it's time for both consumers and manufacturers to forget about this tamed 800 pound Response Time gorilla and focus on much more productive and fascinating display technology and marketing issues, such as the upcoming generations of 3D displays. As a result our bottom line recommendations are… If you stick with the mid to top tier models from the reputable brands, you should ignore Response Time specifications, not worry about LCD motion blur, and don’t spend extra for 120 Hz or higher refresh rates, strobed LED backlighting, or advanced motion blur processing.